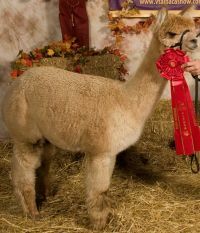 Orion won First Place at the LA Deep South Alpaca Fleece Show in 2010! 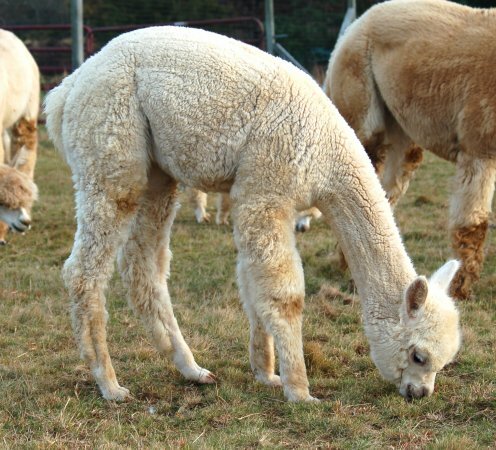 Amazing, considering how competitive white fleece is! Orion has been sired by the CCNF Royal Odin. 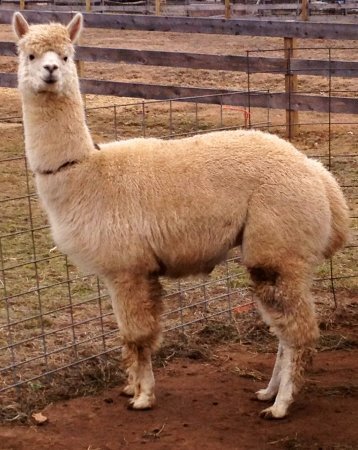 Orion's sire, Odin, has exhibited consistent incredibly dense high frequency high amplitude crimp from top-knot to belly to stifle. Every judge he's shown under has commented on his commanding presence gorgeous head and outstanding density. 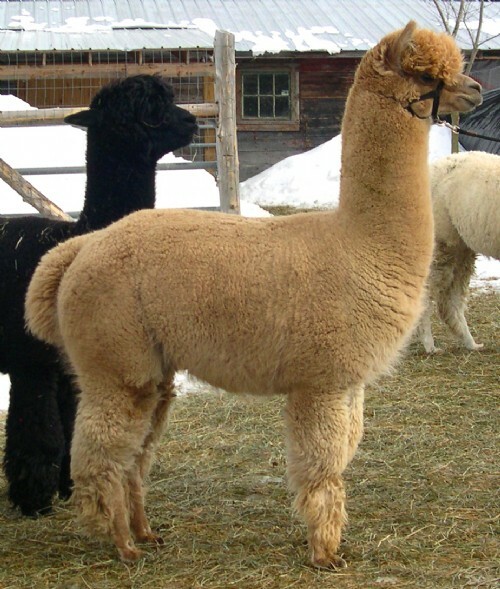 CCNF Royal Odin, was paired with Archangel's Arias to yield of very special alpaca, worthy of his impressive lineage. 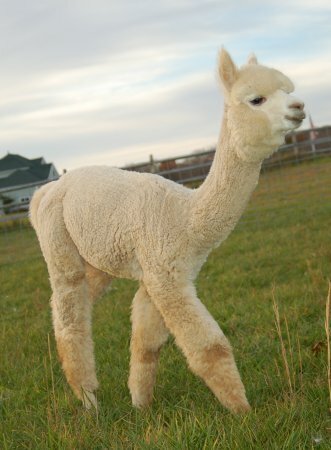 His conformation and presence and his fleece is gorgeous! 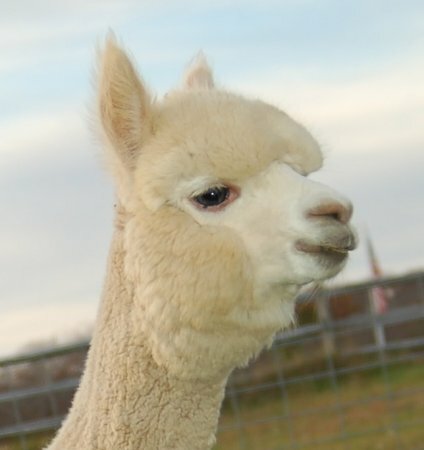 Orion is a very sweet and gentle alpaca who is very easy to handle and would make a great addition to any herd! 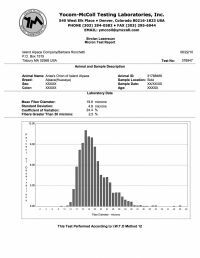 Arias has fine fiber with a very lustrous crimp, a perfect bite and conformation. Her sire, the multiple champion CCNF Archangel, is a legend in his time. He has won over eight national championships, and is considered "the complete package" by many. 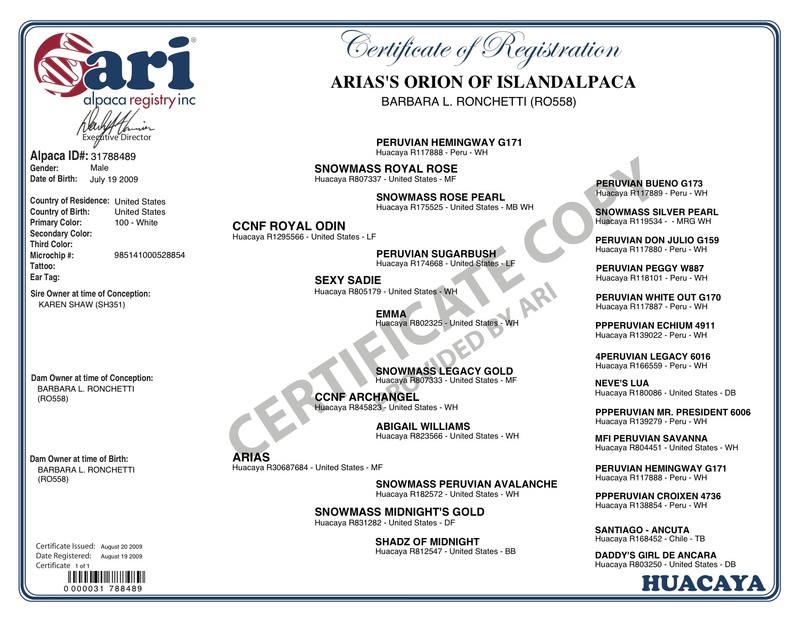 (As of 2008 Archangel is no longer be offered for inside OR outside breeding). Orion's sire, CCNF Royal Odin received the Blue at Big "E" then turned around and was awarded the Blue and Reserve Color Champion at the Coastal Classic. As if that weren't enough he received another Blue in the Fawn category at the fleece competition! Odin was awarded the Blue at Empire and Second at the highly competitive Green Mountain Show in Vermont. Champion and multiple blue ribbon winner! 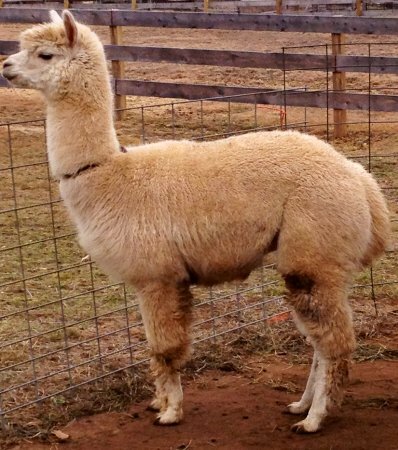 Odin has incredible poise and stature and his fiber just gets better and better. He exhibits consistent, incredibly dense, high frequency, high amplitude crimp from topknot to belly to stifle. Every judge he's shown under has commented on his commanding presence, gorgeous head and outstanding density.